Brides get incredibly jittery when they shop jewellery before their bridal outfit. Oops! Some of you might have already committed this blunder. For the new brides in making we won’t let you commit this blunder again! When wedding time is on our heads; seldom having no clarity of what to purchase and what not to, makes the situation much worse. Planning before purchasing is must to avoid any blunders. Check out the Most Common Mistakes Brides Make While Selecting Their Bridal Dress. Purchasing the 22ct gold jewellery before the outfit will put you under pressure of matching it with the bridal outfit and will make you settle on choices. So, to be on the safer side first get the bridal outfit and ask the merchant for an extra sample of it. Carrying that swatch while purchasing bridal jewellery will make it easier for you. While being on the hunt for the suitable bridal jewellery, you should always keep in mind about the style and detailing of your outfit. Whether it’s beadwork, thread work, shades or patterns, embroidery, colours, have a clear picture of your outfit. It will help in choosing the right jewellery for your overall ‘Look’. 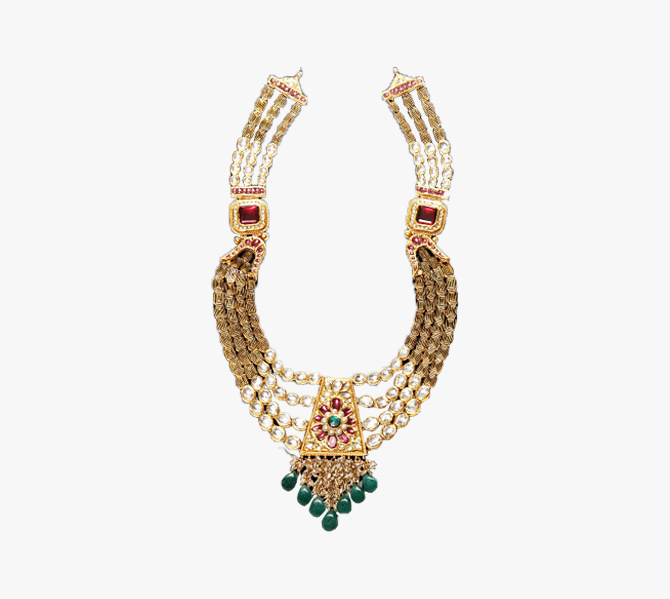 Be smart while making the right selection for the necklace which will be apt as per to your neckline. Wrong placements of necklaces or overlapping sets can lead to an abhorrent look. While layering, It’s always good to address for the right combination regarding colour and sizes. Just in case it’s a continuing trend it’s not essential that it will fall under your tree. For, eg. The spreaded gown are quite in these days; everybody must have noticed them on every other Hollywood celebrity right? While choosing for own good, you should keep your forehead, your features in mind to carry them well off! Size of your gold earrings should be shortlisted precisely. If a bride is opting for a choker, make a stylish move with earrings. Generally, studs are a safer and better choice than long earrings. Ram Prakash Jewelers treats every client like family. Our goal has always been to render high quality jewelry at the best possible cost. Growing up, we were taught to create everything as if you are making it for a loved one. With professional experience, precision, care, and high quality goods, RPS jewellers have been able to create fabulous jewelry at very impressive rates.